One of my great pleasures of mystery fan conferences such as Malice Domestic and Left Coast Crime is the opportunity to talk with a wide variety of readers. When I get to chatting with a reader I usually ask about favorite authors to compare notes. After a while I’ll ask about how they approach series. Writers and publishers like series because of the long-tail effect: if someone reads one book in the series and enjoys it, chances are good they’ll read another in the series, and another and another. Each new addition to the series not only has the potential to sell to fans, but bring in new readers who will ultimately want to read the entire series. A couple of years ago my better half, Jan, and I were attending Malice Domestic. We wanted to read all of the books nominated for Best Contemporary Novel. 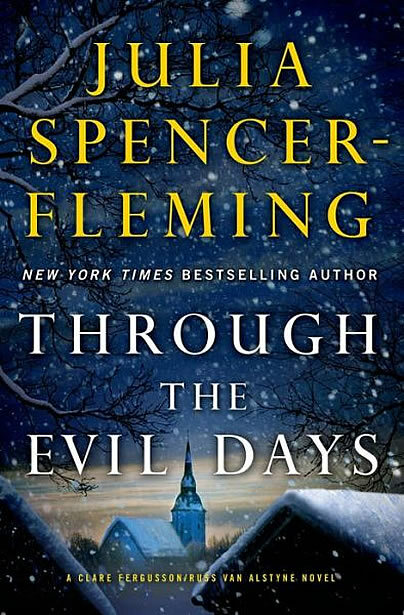 Jan discovered that Julia Spencer-Fleming’s Through the Evil Days was part of a series. Rather than just read that book, Jan wanted to read the entire eight books in order. So she blitz read her way through the series in about two months’ time (while reading the other new-to-her books as well). It turns out Jan is not alone. A significant percentage of people I’ve talked are like her. (I wish I had kept an accurate account so I could tell you the exact percentage.) They strongly prefer to read series novels in order—some so much so that they will not read a series out-of-order! Can you imagine how long it would take a reader new to Sue Grafton to catch up on Kinsey Milhone and the now twenty-four alphabet books starting with A is for Alibi and ending currently ending with X? Not going to happen, right? Not only does Grafton have a top twenty hit two and a half weeks after its release, she has seven other books in the top 10,000 Kindle sellers: the previous three and the first three. People are catching up if they’ve missed a few books, and people are starting at the beginning. This long tail is why publishers like successful series. To allow that piling on effect, publishing contracts were (and often still are) for three books. When presented with the Catch 22 situation that if no one buys the first books in a series, there won’t be more books, the next response is something like, “I want to make sure the series will be there.” Particularly with small presses and self-publishing they don’t want to invest in a character for only one or two books. From my sampling of folks, those with this attitude often require a minimum of three books, and preferably four or five in a series, before they will become interested. (1) Do you prefer reading series in order? If so, must you start at the beginning, or do you read the most recent and then if you enjoyed it go back and start from the beginning? (2) Do you have a required minimum number of published books before you’ll start reading a series, and if so how many? For those of you who want at least three, my Seamus McCree novels are now eligible for your consideration. You can read them in order: Ant Farm, Bad Policy, and Cabin Fever. (Notice I subtly stole the alphabet idea from Sue Grafton?) For those who want at least four, I promise Doubtful Relations will be published in 2016. Hmmm... I must go against the grain. I do prefer to read in order but in all honesty, I'd just rather read and I think the burden is on the author to make series books readable in any order. As for the number of books in the series, I've never really considered how many books are in the series. It does make me sad when a series disappears but if it sounds good, I'm willing to give it a try. I used to be a bookseller so maybe that explains some of my attitude! I agree with you that authors have the responsibility to make series books readable in any order -- unless we're talking something like a trilogy, which is really a 1,000 page book split into three pieces. Then, I think the author can assume the reader is indeed reading them in the proper order. Personally, I don't care how many books are available in a series--if I like the one at hand, I'll read it. I almost never read another book in a series immediately after I've read the previous one. I like to try something different before returning to the same author. As a writer with only one book out, I have to hope there are more readers like me, since as you point out, there won't be more unless the first one sells. Allan -- there are obviously lots of people with your sensibilities, otherwise no new series by a new author would get off the ground! I started Grafton's series with G is for Gumshoe, loved it, and went back to A. I've read every book of hers (including Kinsey and Me, short stories). I do love series, but I also read standalone novels etc. To me it's more about the quality of the writing, not the quantity. Judy -- wouldn't it be interesting to know what percentage of reading in the mystery/suspense/thriller genre is part of a series and what are standalones. Perhaps the next time I want to procrastinate, I'll check myself for the last few years. Interesting. As an author with one series of multiple books and the first book in my new series out I tend to agree with the fact readers like more books under the authors belt. My first series took off after the third book and the first in my new series is a slow starter. As a reader I tend to like series books rather then stand alone. I also wonder if there is a difference in preference between men and women. I am split. On one hand, A series is appealing because you know the character or characters will be around. That said, on the other hand, constant cliffhangers and no resolutions are annoying. Quality of the writing is first and foremost. One well-written stand alone is worth more (actually an un-quantifiable amount) than any series. I gave up on one very popular Urban Fantasy murder/mystery series because the protagonist grew into stupid. A characteristic I can only assume was to feed the next installment. Speaking of the men and women question, I read a series that was edgy and wonderful until the last (I assume since there have been no more) had a softer more romantic feel, and the characters' actions felt contrived. The ratings reflected my feelings. The author later revealed he had co-written this particular one with his wife, and aspiring Romance writer(I read Romance when I want to read a romance). Kudos for the spousal support, however, I am not sure sacrificing a successful series and the author's style(Hard Boiled tough guy) worth it.